Banh trang tron 'rice paper mix' is a street food that has won the hearts of children and teenager all over Vietnam. I was first introduced to this popular street snack several years ago while I was in Saigon. My cousin picked up a bag on his way home from class. He walked in with a clear plastic bag dangling from his fingers with two skewers (used as chopstick) poking out from the bag. I opened up the bag to examine what was inside; strips up rice paper, julienned green mango, shredded beef jerky, quail egg, roasted peanuts, and chopped Vietnamese coriander (rau ram). It was such an unusual concoction but had all of my favorite components. I'm always excited to try new food so I had no problem digging in. While I very much enjoy the explosion of flavors, my mom thought it was 'nonsense' food. 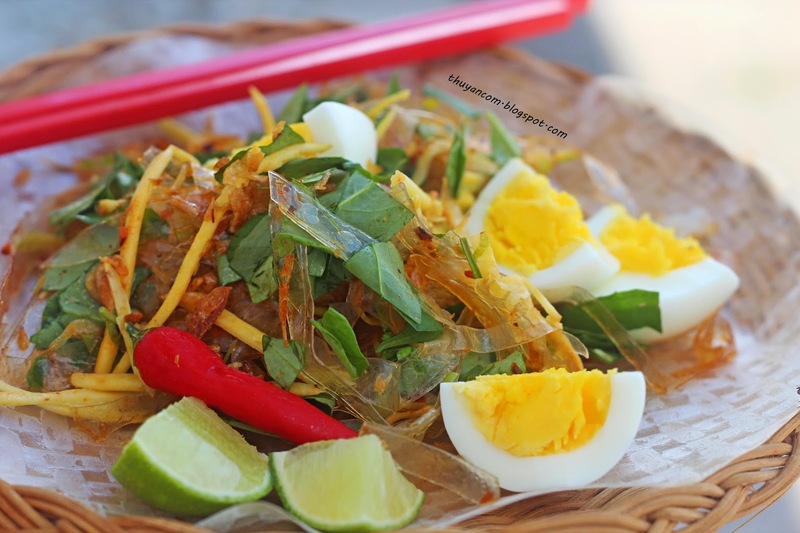 Upon my first tasting of banh trang tron, I thought it tasted similar to padd Thai. After a few more bites the flavor became more coherent; it was tangy and spicy similar to other Vietnamese goi but more salty and dry. I can see why adults would be against this type of snack, it's not very nutritious. But it's FUN food, something I like to make every now and then. I hope you enjoy my interpretation of this popular street food! 1. Sauteed the green onions in the oil until fragrance. 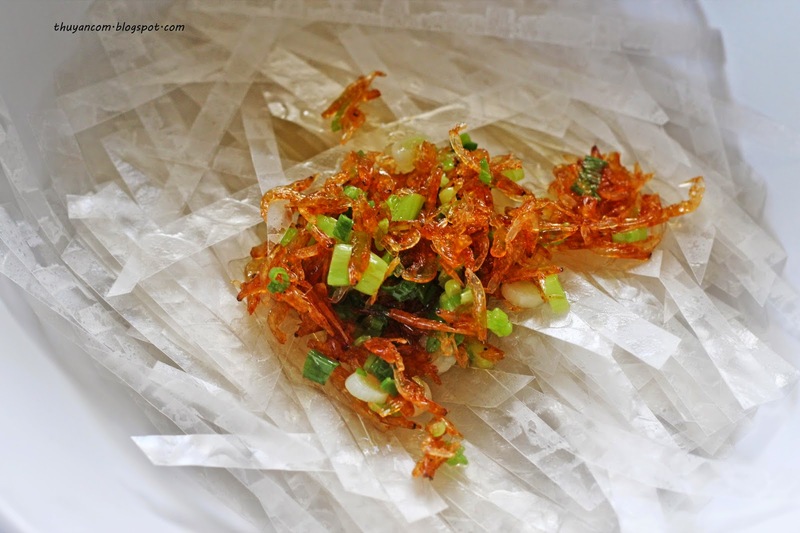 If you are using tep kho (dehydrated field shrimp) add it to the oil and sauteed until fragrance. 2. 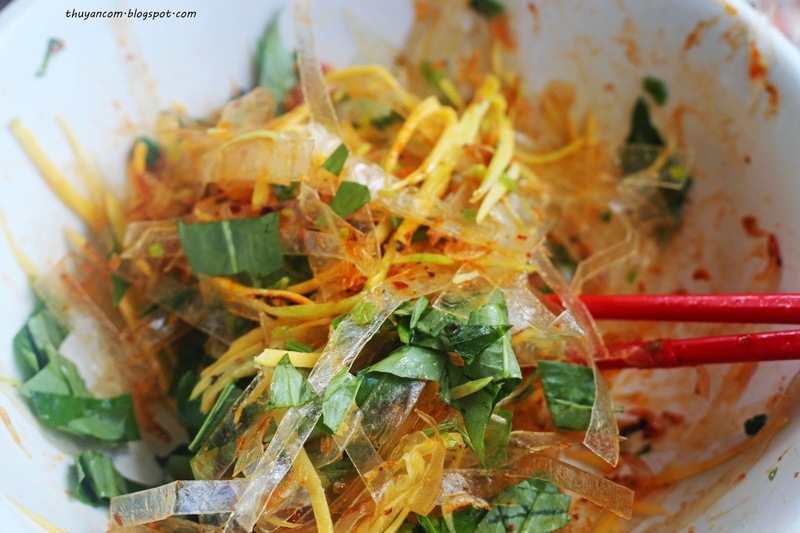 Add the rice paper strips to a large bowl and the add the hot oil with green onions and tep kho. 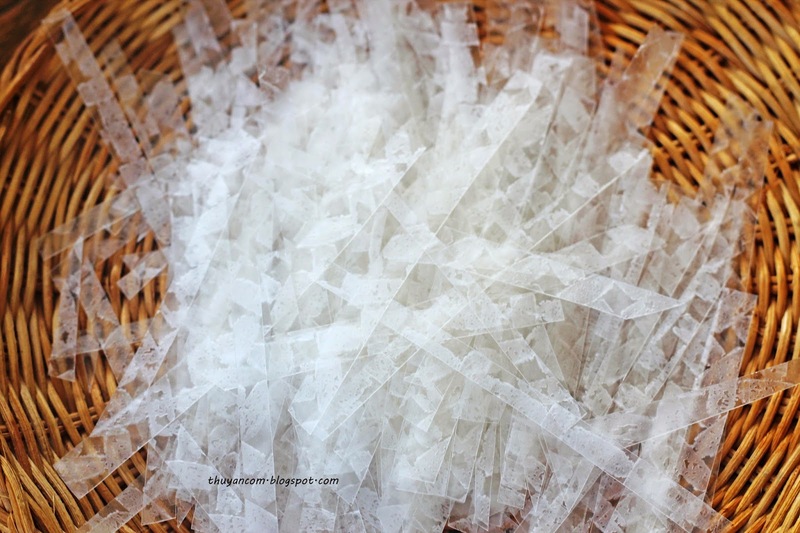 Use your gloves to mix as much of rice paper and oil together to help soften the rice paper. 3. Season the rice paper with 1 lime, some shrimp salt (sea salt is a lot saltier so use it sparingly), a sprinkle of sugar, juice of 1 lime, hot chili oil, and a couple dash of maggi seasoning. Mix well or it will get clumpy. Make sure every portion of the rice paper is season thoroughly. 4. 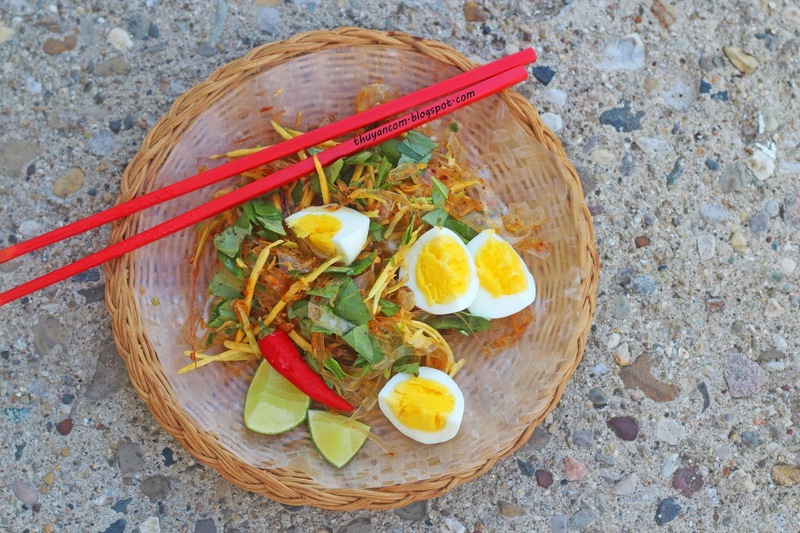 Once you are satisfied with the seasoning add the green mango, shredded protein, quail egg, chopped rau rau, crush peanuts, and fried shallot. Toss and mix so that all the components are evenly distributed. wow i've never had this. must try! I love this dish, one of my favs. Thanks for posting this recipe. Món này Thúy làm trông ngon ghê! Sắp spring rồi, mình rất thích ăn món nào vừa nhẹ vừa mát. Cảm ơn Thúy đã share với cả nhà. If you’re really feeling adventurous why not try our unique “Scooter Tour Saigon” while you sit on the back of a scooter with our expert drivers and eat at the best local street food stalls and discover hard-to-find gems that most tourists would miss? The Foodie tour on Saigon Street is the right choice for you! Yummy. Wanna try make this dish this weekend. Hello! Thank you for giving this information. I've been looking for the recipe but all of them were only in Vietnamese so I cannot read that. I hope you provide an information about Banh Trang Sa Te also, coz I loved it so much!